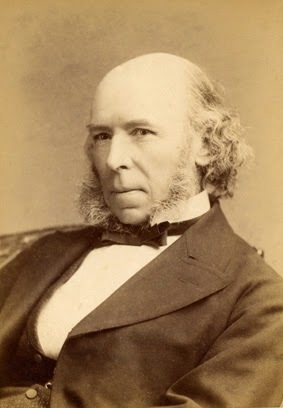 Influential Americans of the Gilded Age were comforted by philosopher Herbert Spencer’s ideas which adapted the theory of evolution to human society. Considered one of the most intelligent men of his generation, Spencer coined the phrase “survival of the fittest,” a concept more related to laissez-faire capitalism than Charles Darwin’s system of biological natural selection. On November 9, 1882, two hundred distinguished gentlemen gathered at Delmonico’s in New York to honor the British philosopher before he departed for England, thereby ending his three-month visit to the United States.1 And while Spencer dreaded having to attend this banquet—he was an insomniac who became irritable and grumpy when something threatened to encroach on his privacy—the other participants were excited about an evening that promised to touch on the burning issues of the Victorian era, such as “intelligent design, the proper role of government, America’s place in the world, and God’s existence.”2 Ironically, the menu shown below unwittingly evokes the theme of this dinner. The lavish menu comprises an engraved card tatted on a satin backing. For this banquet, they were made in various colors, each with a matching silk bow. 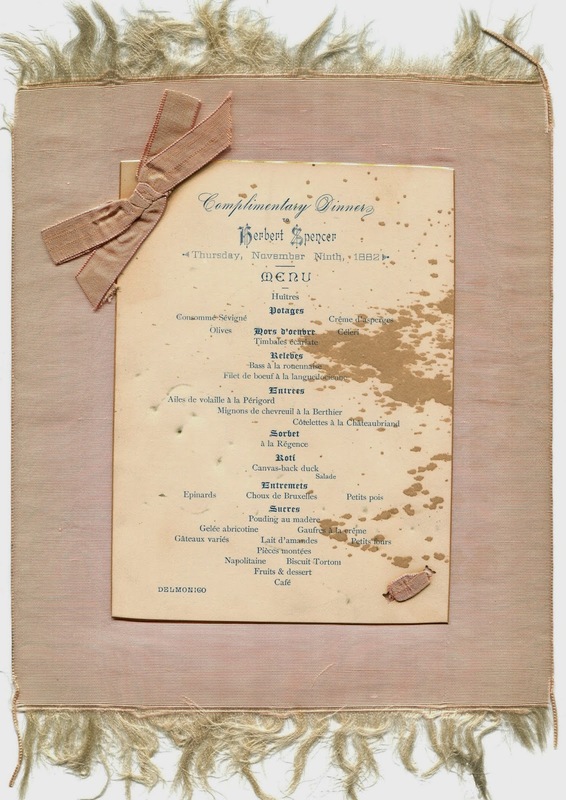 Although it is not unusual for old menus to have small stains left by drips of gravy and other mishaps from when they were used, the splash marks on this one are particularly bad, making its survival all the more improbable. And yet, despite these flaws, this menu has been preserved for more than 130 years. By Spencerian logic, its continued existence is prima facie evidence of its superiority. 1. Delmonico’s would have charged about $2,400 for this banquet. Friends and colleagues who organized this event recouped some of this expense by selling tickets for $12 each, not an insignificant amount given that eminent professors then earned about $250 per month. The organizers bore some of the expenses themselves, such as the expensive menus that were probably made by the stationer and printer Borden & Cain at 46 West Broadway. Speakers were given tickets in consideration of their services. 2. Barry Werth, Banquet at Delmonico’s: Great Minds, the Gilded Age and the Triumph of Evolution in America, New York, 2009.